5 summers ago I had a Greek family staying with us: a mother and 2 adult children; her son and daughter in their mid 20’s. They came to stay for a few days, but ended up staying for 3 weeks. At the time – just like now – I loved waking up very early in the morning and cooking by myself with the doors closed. It was like meditation for me. Not thinking of anything but cooking! The first morning that the Greek family was there, I saw the mother standing outside the shop. Her children went out the evening before and were sleeping in, like they would continue to do. I pretended that I did not see her so she waited patiently for the doors to open and take her coffee. We both knew but said nothing. The second day I just felt guilty so I opened the door and we made a coffee for both of us. I continued with my work while she was just standing near. I was so thankful that she would not talk too much! It was like we had an agreement not to say anything. We were testing one another but at the same time approving of each other. From the third day she started helping me to clear up when I was finished, but I could see that she would really love to cook. We started cooking together from the next day. She was a great cooking companion: loving the smells and kitchen as much as I did and enjoying the same jokes. She was grateful to have something to do while her children were sleeping. Before she left she gave me this recipe from her grandmother. 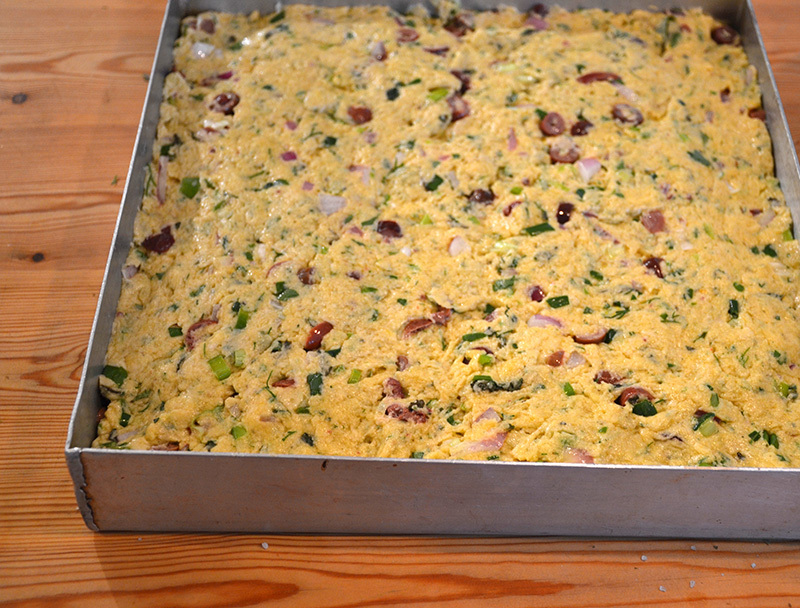 She called it Eliopsomo, but it is more like a savory cake with olives, oranges and herbs. It is lovely in the winter with the freshly picked olives and the newly pressed olive oil! The best present! Cooking with more people is like therapy, it makes us feel free with each other and we can talk openly. Sharing parts of our life I suppose makes us more open. I hope you enjoy this delicious recipe, bake it together with friends and family if you can! Three important ingredients for the Eliopsomo: black olives, orange juice and olive oil. …and add the mixed flour and baking powder. Mix well with a wooden spoon until you have a nice and thick homogeneous dough. Spread the dough evenly in a baking dish and put it in the oven. Here you go! The smell of the herbs and olive oil with the orange are fantastic! Serve it warm (cold is fine as well) with cheese (kefalotiri if you have it) and a glass of red wine from Nemea. 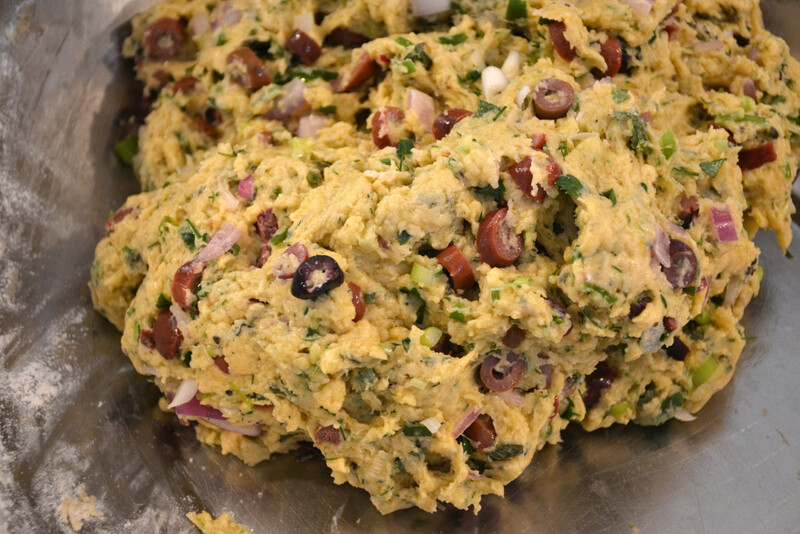 Mix the chopped olives, olive oil, orange juice, spring onions and mint in a large bowl. Add the egg and continue to mix well with a fork. In another bowl mix the flour and baking powder together. Add the bowl with the flour and baking powder to the first bowl and mix well with a wooden spoon until you have a nice and thick homogeneous dough. Spread the dough evenly in a baking dish and bake in moderate oven 180 C / 350 F, for 30 to 40 minutes. It rises a bit but not too much and stays slightly moist inside. The smell of the herbs and olive oil with the orange are fantastic! Serve it warm (cold is fine as well) with cheese (kefalotiri if you have it) and a glass of red wine from Nemea! Gia mas! Hi Katerina, Greetings for Christmas from the Burian family. We wish you and your family all the best for the New Year. This recipe sounds delicious but can it be cut down to make for just a few people? Hallo Edie, our best wishes to you from the Odyssey family for a joyful Christmas. I hope 2015 will bring happiness and health to all. Yes this recipe you can cut it down for just a few people, just adjust the quantities. But you can have it the first day you cook it as a main course with onions capers , fresh salad , and fresh bread and (if you have) leftovers you can keep them in the fridge for a week and use it as a dip with sticks of cucumber , paprika, onion and of course bread !